In 1842 Joseph Smith, the first prophet and president of The Church of Jesus Christ of Latter-day Saints, wrote down 13 of the religion’s fundamental beliefs. We pulled a Star Wars and already covered number 11 in a past video, but now we’re rewinding to number 1. Pretty simple, right? God is our Heavenly Father. We are all children of God. He loves us. Jesus Christ is God’s son, our Savior and Redeemer. But then we run into a problem because the Bible clearly states that there is exactly one God, but that the Father is God, Jesus Christ is God, and the Holy Spirit is also God. So what do we do with that? Christianity has worked for millennia trying to reconcile those teachings. The most popular reconciliation is that God the Father, Jesus Christ, and the Holy Spirit are somehow one god in three persons. This is called Trinitarianism, which became a formalized teaching of the Catholic Church centuries after Christ’s death, and subsequently became the belief of most Protestant denominations. It’s the result of people trying their best to understand God, an extremely noble cause. But Latter-day Saints do not believe in traditional Trinitarianism. We believe God the Father, Jesus Christ, and the Holy Spirit are three distinct and separate beings, but 100% in sync with each other so much so that they are one god. They are one in purpose. There is only one agenda, one will, one plan. In pretty much every conceivable way except physically, we believe they are unified. We do not believe they are one in essence and three in person. We believe they are three in essence and one in purpose. Now, does that make us polytheistic? You can believe that if you’d like. We don’t call ourselves polytheists, but it just depends on your perspective. Some people believe the doctrine of the Trinity is still polytheistic, and that’s OK. Good people can disagree. Latter-day Saints believe the Father, Jesus Christ, and the Holy Spirit are much more one than they are three, just in a different sense than Trinitarians believe. Some might call us Social Trinitarians, but the title isn’t important. 3 beings, one Godhead. The scriptures tell us that God is spirit. We also believe God the Father’s spirit is combined with a perfected, immortal, glorified, and tangible body of flesh and bones, just as Jesus Christ received after his resurrection and similar to what Paul teaches we will receive after we are resurrected. A living body always has a spirit within. However, a spirit is not always coupled with a living body. For example, we believe the Holy Spirit is just that—a spirit without a physical body. The nature of God is a hot topic. People use the same bible to debate several different perspectives, simply because the Bible is subject to interpretation from everyone. In part, that’s why it took Trinitarianism so long to come onto the scene. We can go to the Bible to show references for our belief in the Godhead, such as when Stephen is filled with the Holy Ghost in Acts 7:55, 56 and has a vision in which he sees “Jesus standing at the right hand of God—but you should probably know right now that we Latter-day Saints, SPOILER ALERT, believe modern prophets have revealed additional scripture that complements the Bible and helps corroborate and clarify what the Bible teaches, just as the individual books of the Bible, written by ancient prophets, do to each other. Some might find that verse contradictory to their interpretation of the Bible. We don’t. But the next question in your mind might be, “well how can I know if the Doctrine and Covenants is actually scripture like the Bible or just a bunch of hooey?” Good question. That’s something that, as you sincerely learn more about The Church of Jesus Christ of Latter-day Saints, you can take to God and discover for yourself. But whether you believe it or not, if you want to know more about basic Latter-day Saint beliefs, subscribe to the channel, leave a comment, and keep an eye out for Article of Faith number 2 coming out soon! The Book of Genesis 1:26, KJV, makes an interesting statement: And God said, Let us make man in our image, after our likeness: and let them have dominion over the fish of the sea, and over the fowl of the air, and over the cattle, and over all the earth, and over every creeping thing that creepeth upon the earth. Many people wonder why this is in the plural, but it’s referring to God the Father and Jesus Christ (through whom all things were/ are created. But The first line of this passage is not found in any manuscripts produced before the 16th century. All Bible scholars now recognize that this passage was inserted to improve the case for the doctrine of the Trinity, which is not clearly stated in the Bible outside of this added passage. 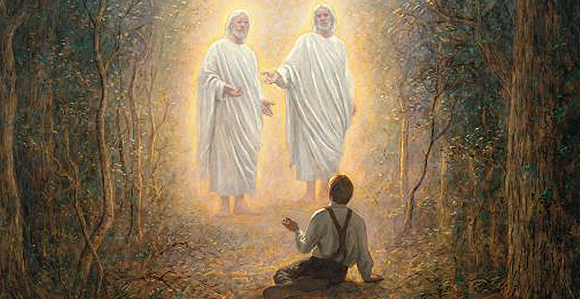 Latter-day Saints believe that resurrection is the highest, choicest state for all living. It was Christ’s great sacrifice that made that blessing available to us. We believe that Christ was resurrected, appeared to His apostles and others in His resurrected state, appeared to His “other sheep” in the Americas as a resurrected being, and remained resurrected and will remain resurrected forever. For the idea of “God incarnate” and the Trinity to work, Christ would need to go back to being spirit God while He is not on earth. Then what happens to His resurrection? That the Trinity is a difficult concept for most Christians shows up when Christians are asked how they see or imagine God. An October 2018 article in Christianity Today Magazine was titled “Christian, What Do You Believe? Probably a Heresy About Jesus, Says Survey.” The article is about the third Ligonier Ministries and LifeWay Research study of the state of American theology. The study asked about 34 Christian beliefs. The study decided that Evangelicals and other Christians are “deeply confused” about their own beliefs. 78 percent agreed that “Jesus is the first and greatest being created by God, which was a view espoused by the ancient heretic Arius.” At the same time, most believed in the Trinity. But they are visualizing God and Christ as two separate beings, one created by the other. Rather than calling this confused, maybe this is the way we naturally visualize the Godhead when we are spiritually still and meditating. Jesus has a Father, and the Holy Ghost, who can dwell in our hearts, bears witness of them. Here are a few more scriptures to think about. Book of Mormon, 2 Nephi, 31:21—And now, behold, my beloved brethren, this is the way; and there is none other way nor name given under heaven whereby man can be saved in the kingdom of God. And now, behold, this is the doctrine of Christ, and the only and true doctrine of the Father, and of the Son, and of the Holy Ghost, which is one God, without end. Amen. 3 Nephi 11:36—And thus will the Father bear record of me, and the Holy Ghost will bear record unto him of the Father and me; for the Father, and I, and the Holy Ghost are one. The Book of Mormon account of Christ’s visit to the Americas in 3 Nephi 11—And they were also conversing about this Jesus Christ, of whom the sign had been given concerning his death. And it came to pass that again they heard the voice, and they understood it not. And again the third time they did hear the voice, and did open their ears to hear it; and their eyes were towards the sound thereof; and they did look steadfastly towards heaven, from whence the sound came. And behold, the third time they did understand the voice which they heard; and it said unto them: Behold my Beloved Son, in whom I am well pleased, in whom I have glorified my name—hear ye him. Doctrine and Covenants 19: 1–3—I am Alpha and Omega, Christ the Lord; yea, even I am he, the beginning and the end, the Redeemer of the world. I, having accomplished and finished the will of him whose I am, even the Father, concerning me—having done this that I might subdue all things unto myself—Retaining all power, even to the destroying of Satan and his works at the end of the world, and the last great day of judgment, which I shall pass upon the inhabitants thereof, judging every man according to his works and the deeds which he hath done. By the power of the Spirit our eyes were opened and our understandings were enlightened, so as to see and understand the things of God—Even those things which were from the beginning before the world was, which were ordained of the Father, through his Only Begotten Son, who was in the bosom of the Father, even from the beginning; Of whom we bear record; and the record which we bear is the fulness of the gospel of Jesus Christ, who is the Son, whom we saw and with whom we conversed in the heavenly vision. And we beheld the glory of the Son, on the right hand of the Father, and received of his fulness; And saw the holy angels, and them who are sanctified before his throne, worshiping God, and the Lamb, who worship him forever and ever. And now, after the many testimonies which have been given of him, this is the testimony, last of all, which we give of him: That he lives! For we saw him, even on the right hand of God; and we heard the voice bearing record that he is the Only Begotten of the Father—That by him, and through him, and of him, the worlds are and were created, and the inhabitants thereof are begotten sons and daughters unto God.